15th China-ASEAN Expo being held in Nanning from September 12 to 15. The Mekong Delta’s Ben Tre province will represent Vietnam at the country’s national pavilion, with the theme “Nice City”, at the 15th China-ASEAN Expo (CAEXPO) in Nanning, China, from September 12 to 15, to promote the characteristics and potential of economic development, culture, and tourism in Ben Tre in particular and Vietnam in general. “We are honored to be the Vietnamese pavilion at CAEXPO for the first time,” Mr. Cao Van Trong, Chairman of the Ben Tre Provincial People’s Committee, told VET. He added that Ben Tre’s coconut products are already exported to China but it wants to boost sales in the future. CAEXPO has attracted the participation of more than 150 Vietnamese enterprises in competitive sectors and with developing export markets in China and ASEAN: agro-forestry-fisheries and processed food, furniture and handicrafts, consumer goods, investment, tourism and trade services. 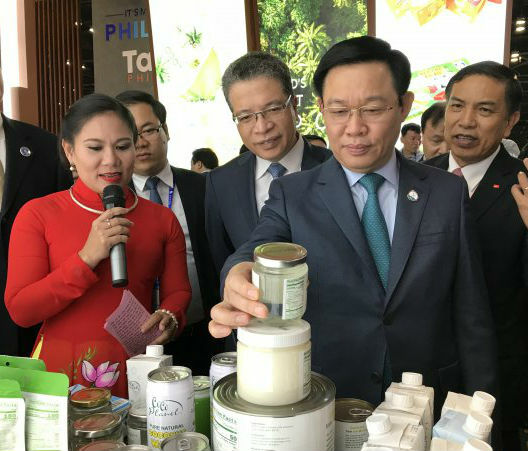 This year is the 15th holding of CAEXPO and Vietnam again has the second-largest display of goods and services within ASEAN, behind only the host country. Known as the “Coconut Capital of Vietnam”, coconut plantations in Ben Tre cover an area of 71,000 and yield 600 million coconuts each year, including 90 million for drinking and 510 million for production. Coconut production in Ben Tre has developed rapidly and accounts for a large proportion of the province’s processing industry, which is considered a key economic sector. Ben Tre has 44 copra processing enterprises creating five main product groups: desiccated coconut, with output of 30,000 tons in 2017, coconut milk with 62,000 tons, coconut candy with over 10,000 tons, refined coconut oil with 320 tons, and coconut milk powder with 800 tons. The machinery used in processing coconuts is new with modern technology, and most stages are mechanized to create products that meet market requirements. Ben Tre currently has about 170 companies processing products from coconut peel. Total capacity stands at about 150,000 to 180,000 tons per year, primarily coconut fiber and coconut peat.